Future Games of London was established in 2009 as the new era of app gaming dawned with the creation of smartphones. Their goal was to create innovative and original mass market content to appeal to the ever-growing world audience, with a main focus on free to play games. Over the years they have certainly achieved this with popular games such as Little Raiders: Robin’s Revenge, Grabatron and of course the much loved Hungry Shark series. Hungry Shark World marks the 6th instalment to this series. In this chapter you get to explore different oceans of the world with a few surprises along the way, but will this new addition keep fans of the series satisfied and wanting more? Leading the life of a shark, your goal is to explore the world’s oceans and chomp your way through as many sea creatures as possible, rising through the food chain to become the ultimate predator. With three stunningly large and quite detailed open worlds to explore, you must survive as long as possible by eating everything in your path. In the beginning you’re not top dog though and have to be careful not to lurk too deep or you will be put back in your place by the larger sea creatures. You play a series of games where your aim is to survive as long as possible by eating the local sea life to keep from starving to death. However, as you feed, you slowly deplete the ocean of the sea life making it important to plan out how you are going to tackle each game so you can travel far without starving. The ocean is your oyster with three huge and vastly different worlds to explore so you won’t get bored as you swim to discover what each level has to offer. 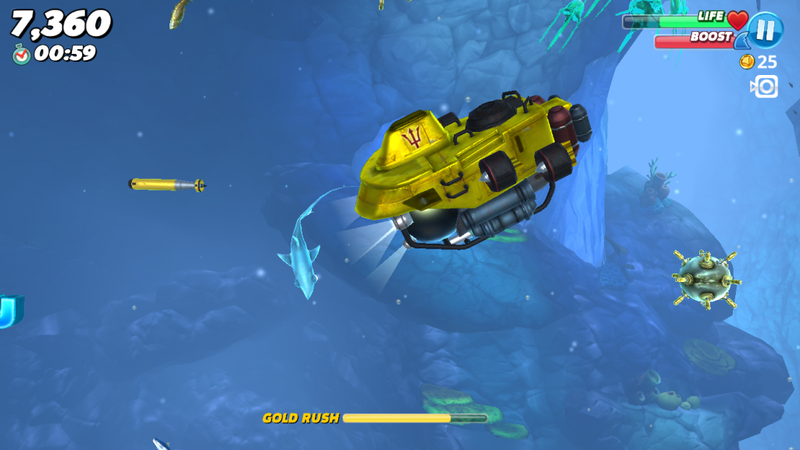 Each level is stunningly detailed in HD, and the developers have taken a huge amount of time to create not only all the sea life in the foreground but also added immense detail to the background, with other moving sea life off in the distance giving even more depth to the 2D experience. Each world of the ocean is vastly different, giving you something new and exciting to explore in each. You start in the Pacific Island tourist hotspot, filled with tropical beaches and foolish tourists frolicking, unware of you in the shallows. The amount of colour jam-packed in the world is amazing and makes you feel like you are on a summer holiday. Next is the Arctic Ocean’s desolate frozen wasteland with a secret military base and wide open spaces. The almost complete lack of colour in this world adds to the coldness of its location and makes you shiver as you explore. Completely different again, the vibrancy of the Arabian Sea is an industrial landscape of pumping oil rigs all with many hidden areas to explore. Having already played this game for several weeks I am still finding new places to visit in all of these locations. The open world format may seem like it could be too big to explore everything from the beginning, but the world has been controlled with gradual boundaries. As you travel further into the depths of the ocean you will come across sea life that are far too large and more aggressive than you and will destroy you until you are a much larger shark. 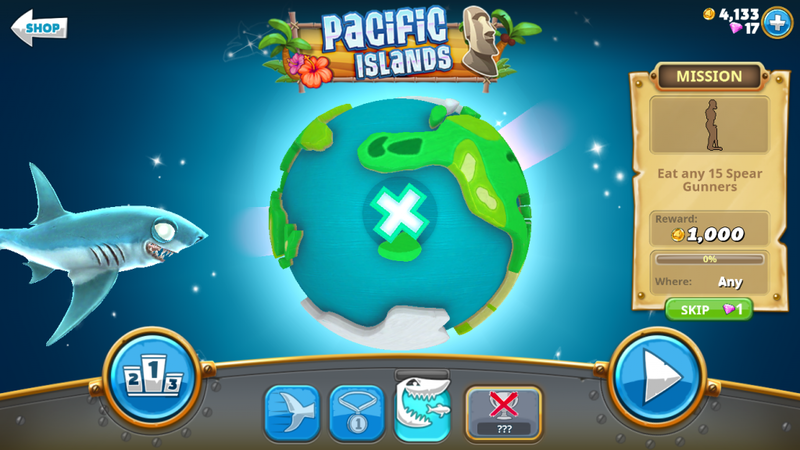 This opens the world to players gradually and gives you goals to work towards, but this is also where the grindyness of the game play can start to take its toll as you will have to collect enough coins to unlock the larger sharks so you can progress and get into these areas. You will have to revisit certain parts of the level over and over again to collect coins and then try to go further into darker areas when you have unlocked a much larger shark to take on these enemies. The game controls are super easy to learn, using one finger to touch on the screen and move in the direction you want the shark to go while using the other finger placing it on the other side of the screen to give your shark a boost. Your shark has a life bar that constantly goes down unless you feed, while the boost bar depletes when you use the boost and replenishes when not using it. These controls are really easy to use making the game accessible to all ages to play without much tutorial work at all. Starting at the bottom of the food chain as Extra Small Shark there are six different sizes you must work through before you become the ultimate predator: Extra Extra Large shark. In each size bracket there are three sharks to choose from with varying stats. 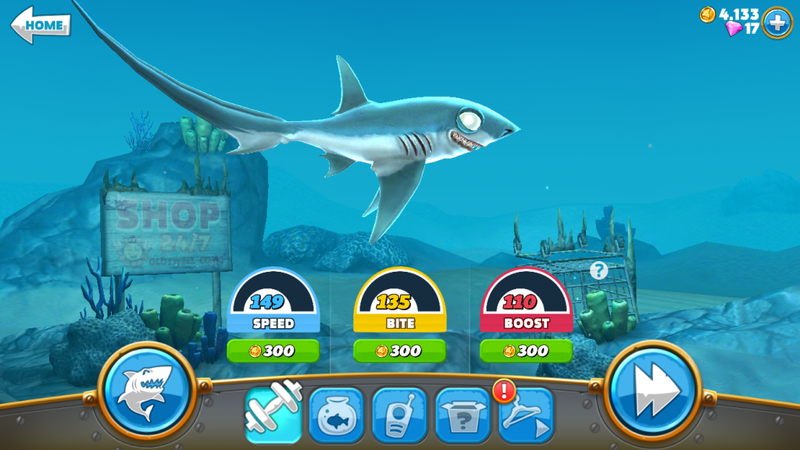 The developers have added more sharks in this new release and not only that, they have slipped in some educational learnings as the sharks are cartoon representations of actual shark breeds and portray some of their real-life characteristics. Everyone loves a bit of subliminal learning! As you unlock larger sharks they have a progressively larger diet, so you can eat more creatures in the level and move past more difficult areas to explore more of the ocean. In addition to this you can also unlock some pets that boost stats such as speed or power, or equip accessories which have other bonuses such as 5% more food in the ocean or shark stat increases. Naturally these bonuses are quite attractive, not only for the tangible benefit but also the ability to dress your shark in absurd items like a pink wig or a kilt. Each time you go into a new game you play arcade style where you try to last as long as possible whilst you work to complete three missions and a daily challenge, giving you lots to do and plenty of opportunity to be able to level up your shark, unlock upgrades and collect coins and gems. There are 20 different mission types to complete that scroll through randomly as you complete the last one. These include getting a high score, swimming a certain distance, surviving a set time or eating a certain number of fish. These challenges give each game a varied feel as when you complete one of these missions you get the next challenge to complete in the next game. Although this was exciting at first and the great amount of variation gave you a sense of purpose to ultimately unlock larger sharks and upgrades, I grew tired of this after a few hours as you end up repeating the same type of mission multiple times to get unlocks. I guess that’s where free to play games get you and you may give in and start paying actual money to speed this process up if you’re impatient. The in-game currency is gold coins and gems. The coins are easily collectable through game play by eating golden sea creatures or humans and can be used to buy new sharks and some accessories. The Gems on the other hand are a much rarer commodity that are barely seen. 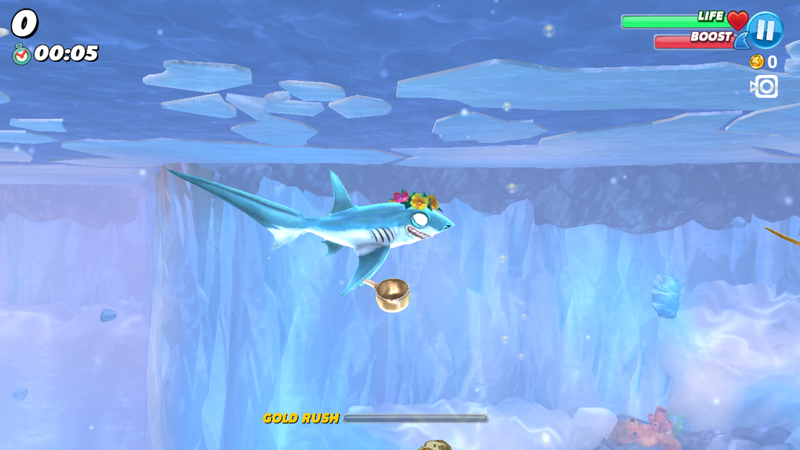 Most of the larger sharks need a lot of these gems to buy and the game really encourages you to buy these for actual money if you want to progress past the level that free coin collection can get you. Whilst I get that developers have to make money from their creation, some of it feels ridiculously expensive. Honestly, would you pay $159.99 for 3,300 gems? A PC game isn’t even that much! There are smaller price brackets starting at $7.99 but it’s just feels like a money grab to get you to spend more rather than pay a one off fee initially for the game. To buy a shark you would be spending anywhere from 14,000 coins for mid-sized sharks to 1500 gems for the later and larger sharks. If you don’t mind the slow grind and keep the app for free then it will be a long time to unlock everything but it will be more satisfying and you will get more gameplay hours out of it. You can also watch ads to get a small amount coins and gems for free, but it’s hardly worth it, you would be watching a lot of ads for not much gain. 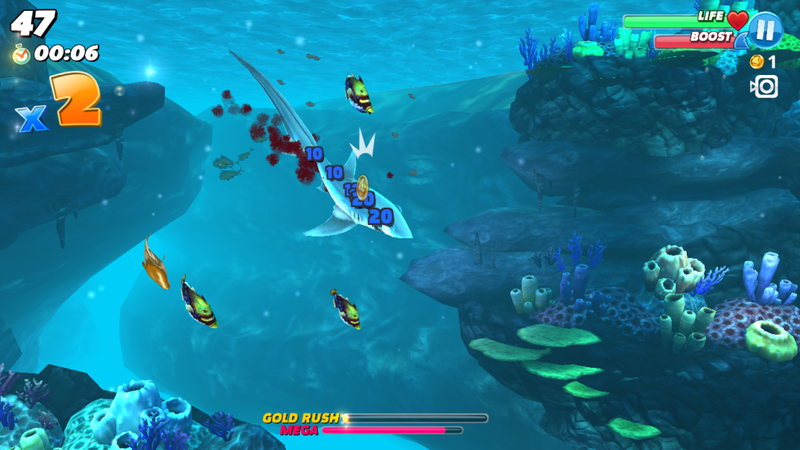 Hungry Shark World has some beautifully detailed graphics showing off the best the ocean has to offer and the gameplay is really easy to pick up and learn for all ages. The game was quite exciting to start with but I grew tired of the slow grind to unlock new levels and upgrades to be able to explore more of the ocean. I refuse to pay money for in-game currency since it’s a free to play game, and I think it would have benefited from a less aggressive freemium model. I also think that a once-off download fee would have been preferable, and I would certainly have paid that as the game is stunning and lots of fun to play. This game will definitely keep the kids entertained for hours though, as they will be able to see different parts of the ocean and all the crazy animals that are lurking below the surface. It is definitely worth a go, and for free you can’t go wrong!